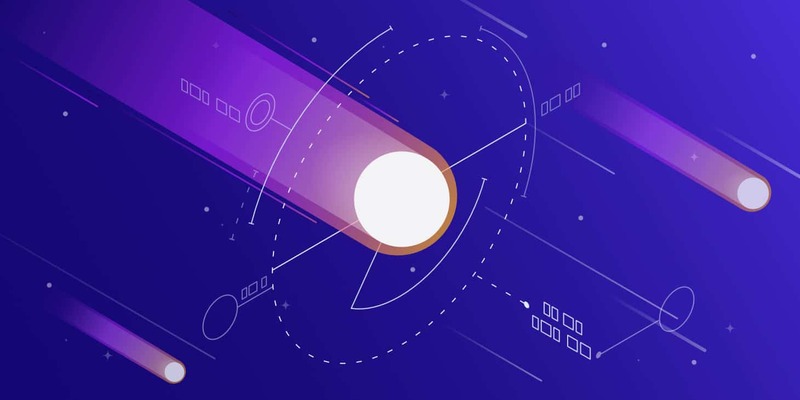 PHP 7.2 has been officially released as of November 30, and it is now available for all Kinsta clients. The release has new features, functions, and improvements that will allow us to write better code. In this post, I will introduce some of the most interesting language features with PHP 7.2. Update: PHP 7.3 is now available for all Kinsta clients! You can see the full list of changes on the Requests For Comments page. In this example we’ve called the test function twice, passing a different object at each call. This was not possible in previous PHP versions. Of course, in PHP 7.2 this code echoes ‘Hello World’. PHP currently does not allow any variance of parameter types between child classes and their parent classes or interfaces. What does that mean? Since PHP 7.2, we are allowed to omit a type in a subclass without breaking any code. This proposal will allow us to upgrade classes to use type hints in libraries without being required to update all subclasses. See Trailing Commas In List Syntax for a closer view at this RFC and some examples of code. Argon2 is a powerful hashing algorithm which was selected as the winner of 2015 Password Hashing Competition, and PHP 7.2 will bring it to us as a secure alternative to the Bcrypt algorithm. See Argon2 Password Hash for more information. Starting from version 7.2, PHP includes the Sodium library into the core. Libsodium is a cross-platform and cross-languages library for encryption, decryption, signatures, password hashing and more. The library was previously available through PECL. For a documented list of Libsodium functions, refer to the library Quick Start Guide. See also PHP 7.2: The First Programming Language to Add Modern Cryptography to its Standard Library. The __autoload function has been superseded by spl_autoload_register in PHP 5.1. Now a deprecation notice would be thrown when it’s encountered during compilation. The $php_errormsg variable is created in the local scope when a non-fatal error is thrown. Since PHP 7.2 error_get_last and error_clear_last should be used instead. create_function() allows the creation of a function with a generated function name, a list of arguments and body code provided as arguments. Due to security issues and bad performance, it has been marked as deprecated and the usage of enclosures is encouraged instead. mbstring.func_overload ini setting set to a non-zero value has been marked as deprecated. (unset) cast is an expression that always returns null and is considered useless. parse_str() parses a query string into an array if the second argument is provided, or into the local symbol table if it is not used. As dinamically setting variables in function’s scope is discouraged for security reasons, the use of parse_str() without the second argument will throw a deprecation notice. gmp_random() is considered to be platform dependent and will be deprecated. Use gmp_random_bits() and gmp_random_rage() instead. each() is used to iterate over an array much like foreach(), but foreach() is preferable for several reasons, including being 10 times faster. Now a deprecation will be thrown on the first call in a loop. The assert() function checks the given assertion and takes appropriate actions if the result is FALSE. The usage of assert() with string argument is now deprecated as it opens an RCE vulnerability. The zend.assertion ini option can be used to prevent evaluation of assertion expressions. $errcontext is an array containing the local variables existing at the time an error is generated. It’s passed as the last argument to error handlers set with the set_error_handler() function. 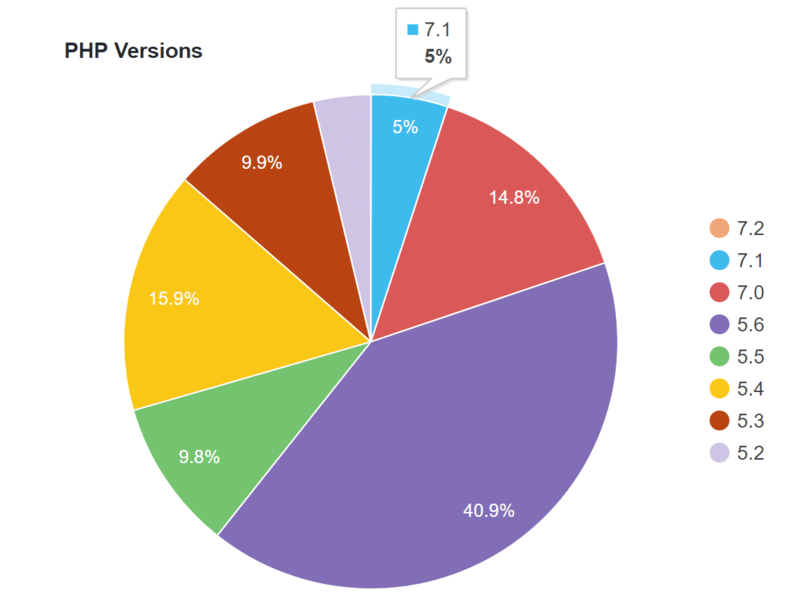 According to the official WordPress Stats page, as of writing this, only 19.8% of WordPress users have upgraded to PHP 7. And only 5% are using PHP 7.1. You can see that a large majority of users, over 40%, are still running on PHP 5.6. What’s even scarier is that over 39% of users are using unsupported PHP versions. 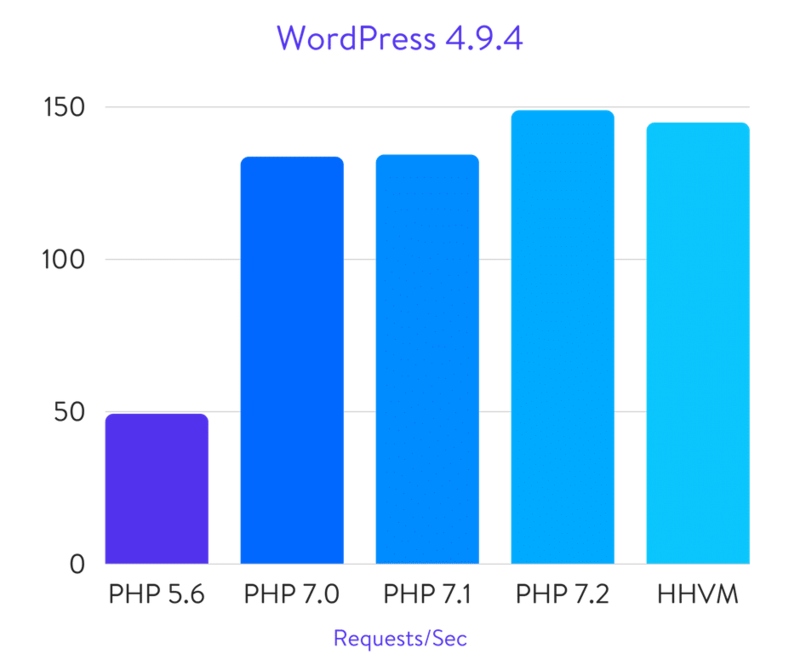 As of December 2016, WordPress.org actually bumped up their official recommendation for users from PHP 5.6 to PHP 7 or greater. WordPress 4.9.4 PHP 7.2 benchmark results: 148.80 req/sec ? PHP 7.2 isn’t quite out yet, but once it is you can start testing. You could test your WordPress site locally or check your scripts in an environment like Docker, which allows you to test different versions of PHP from the command line. Or you can utilize a staging environment, as this will more closely resemble a live production site. 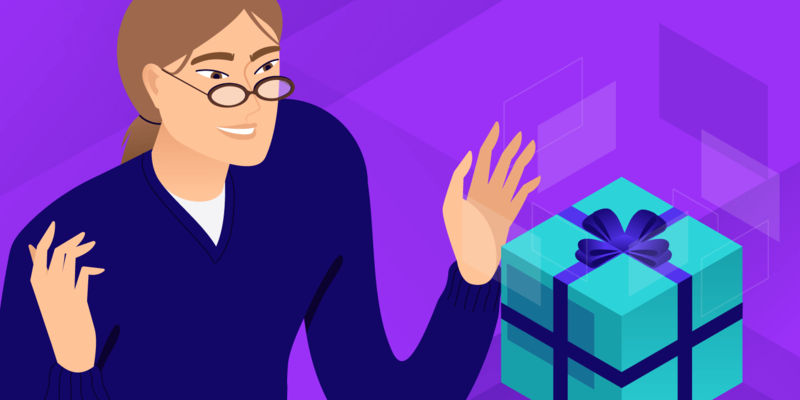 Kinsta made PHP 7.2 available for all clients on December 4th. 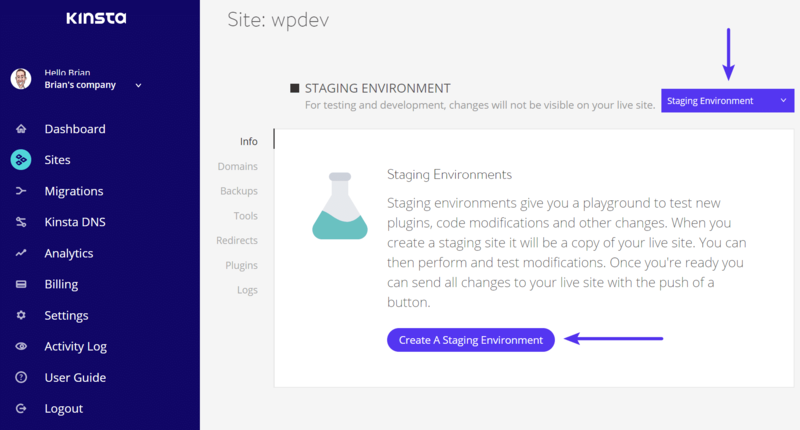 You can easily create a staging environment with a single click. 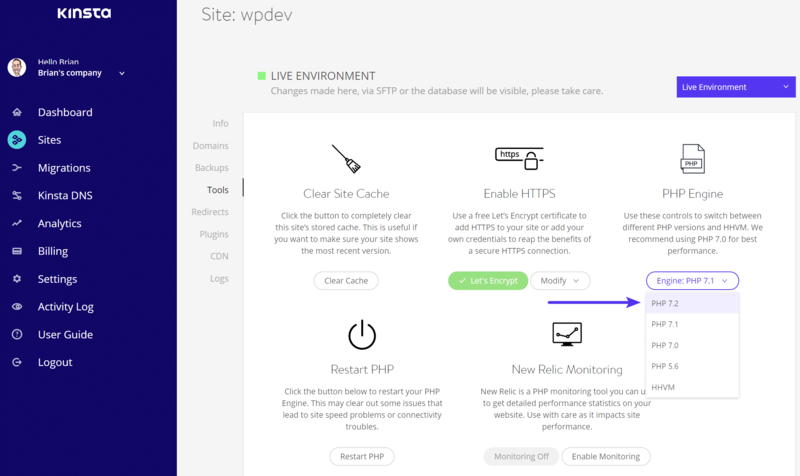 Simply one-click change the PHP Engine for the staging site under “Tools” and you can start testing to ensure compatibility of your third-party plugins and themes. Once you confirm everything works, you can either change your production site over to PHP 7.2 or push your staging site to live. Are you ready to switch to PHP 7.2? Hopefully, by now you have at least made the transition to PHP 7. If you haven’t now is a good time to start testing. 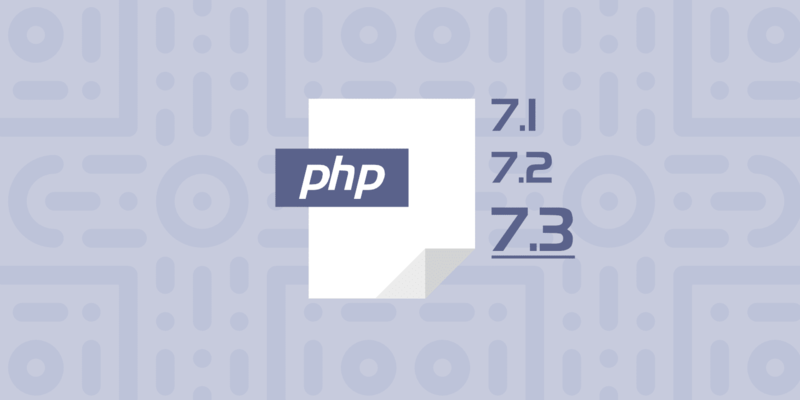 So, upgrade your scripts, check your code and let us know your first impressions of PHP 7.2. Recommended reading: Is PHP dead? Most of the problem with the slow pace of upgrades is that most hosts won’t get their acts together. It’s usually not the site owner’s fault. Definitely agree Casey. Hosts are a huge part of the problem! However there are good ones out there. We’ve offered PHP 7 here at Kinsta since the first stable release in 2015. We then followed up with PHP 7.1 February of this year, and will be doing the same for PHP 7.2. A lot of plugins will need to update, because of the use of create_function(). Thx for this summary. But I found a mistake. The section “Trailing commas in list syntax” lists several options where we can use trailing commas in PHP 7.2 but the list is wrong. Only “Grouped namepaces only” are accepted and implemented. Thank you for pointing it out Hans. GIVE ME RANDOM NUMBER ALREADY!!! For rolling out PHP 7.2, I think you mean December 1st. There is no 31st of November. Great post. Thank you, Sir. Yes, it is time to speed up our sites, with new PHP 7.2. By the way, why you don’t use discuss anymore? We moved away from Disqus mainly due to SEO purposes and indexing of comments. Excellent news, I really enjoy PHP upgrades, and much old versions like 5- use to create some issues and loading delay. Definitely exciting news! Each new version of PHP has shown performance improvements over the last. But for my own projects, I’ve just upgraded to 7.1 (from 5.6) and the performance gain is sweeet! Yes there will always be those types of projects :) That’s why we are still offering PHP 5.6 (lowest supported version). And yes, the performance gains from 5.6 to 7+ are definitely significant! Type Narrowing??? Since ConcreteClass implements GeneralInterface, so the instance of ConcreteClass will be the instance of GeneralInterface too. So why can’t I be more strict and specific in the implementation/extension? I wanted to move my site to PHP 7.2, the stuff here really helped me make the right decision. Hello! I just update to PHP 7.2, unfortunately I got this 2 lines on ‘Add New Plugin’ in the admin dashboard “stdClass::$plugin in /home/mediamak/public_html/wp-includes/class-wp-list-util.php on line 150”. I came here with keyword ‘the best setting for PHP 7.2’ and I believe that someone will help me on this issue. I can’t even update my plugin as well as view its detail, it is the only one popular seo in the world. The rest looks fine. Is it because of PHP 7.2? So far, I did not find any solution yet even almost 3 days I am searching about this on Google. Any help would be appreciated. I also understand with simple English. Thank you. Sounds like you might be running a plugin that isn’t compatible with PHP 7.2. We suggest disabling all your plugins temporarily and re-enabling them one by one until you find the culprit. Really informative article, thanks a lot!